The goal of this Translational Research Day is to foster interactions between clinicians and researchers in the North-West inter-region, networking and setting up collaborative projects. This is a first day that will bring together the actors of the NOC and CLIP2 of Caen and Lille. 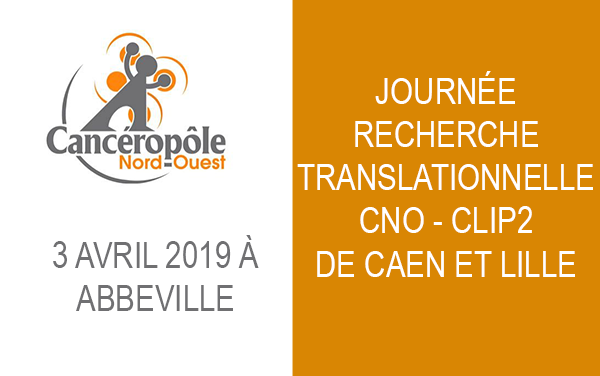 In the morning: Presentation of CLIP2 from Caen and Lille and the NOC’s research axes, followed by a round table: How to make fundamental research, CLIPs and the pharmaceutical industry interact? Afternoon: Work in small groups in parallel around 3 themes that will concern radiotherapy; personalized medicine; hematology. The research teams will be able to quickly present their research work in progress, clinical clinicians in the process of editing / writing in order to address the questions / expectations that arise on both sides to finalize collaborative translational projects.